See also the article by Jo Poole "The Restoration of Darwin's Rooms" and the BBC Cambridgeshire Gallery "Charles Darwin's rooms". Photographs of the room as finally restored, taken by Allison Maletz in February 2009, are shown in the College Life Gallery. John van Wyhe talks on The Science Show, ABC Radio (Australia) about Darwin's room and daily life in college, and discusses historical evidence for some famous Darwin stories. The Darwin Committee at Christ’s College was formed in 2006 to prepare for the anniversaries of the College’s most famous alumnus. As the Darwin historian on the committee I was very eager to restore Darwin’s rooms to their early nineteenth-century appearance and open them to the public for the first time since 1909. No drawings or descriptions of Darwin’s rooms as he knew them survive. 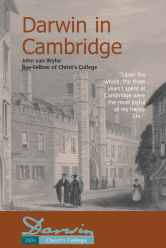 The restoration is based on research by myself and Jo Poole into contemporary documents ranging from Darwin’s letters and private papers, recollections of his Cambridge friends, illustrations and descriptions of Cambridge student life in the 1820s-1830s and the physical evidence present in the rooms as investigated by Matthew Beesley and David Bartram. Jo Poole was engaged by the College to assist with the restoration in 2008. It was her aim to recreate the warm, elegant Regency atmosphere the young Darwin would have worked and played in during his time at Christ’s. Her involvement has led to a major boost in the level of authenticity acheived. Jo Poole has written an essay on the restoration which will appear in the booklet Darwin in Cambridge (Christ's College, 2009) and elsewhere. Darwin’s rooms are on the first floor of the south side of the first court of Christ’s College, now room, reached via the middle staircase in the photograph on the right. The building dates from the early sixteenth century. In 1758 the walls facing into first court were refronted with Ketton stone in a simple classical style. By passing through the passage to the Undergraduate library it is possible to view the south side of teh range which is still the original clunch and red brick. It seems that no substantial interior structural changes have taken place since that time. The sash windows were added at some point in the eighteenth century. The stairway leading up to Darwin’s rooms was originally twice as wide and filled the entire passage. The passage was opened in the mid-twentieth century to give access to the new Undergraduate Library. David Bartram, a consultant for the National Trust, conducted an initial inspection of the rooms with me in 2006 and suggested that the oak panelling around the fireplace was built in situ. The remaining panelling was taken from another source, probably from within the College, judging from the similarity of the friezes. Numerous rough cuts and unmatching panels (some inserted upside down) also attest to the fact that the remaining panelling was added later. The two ornamental doors on the west side open onto brick walls. The earliest known depiction of the interior of Darwin’s rooms is a photograph by J. Palmer Clarke taken in 1909 on the occasion of the Darwin centenary and published in the same year in the College Magazine. This is still the most widely used image of Darwin's student rooms. The furnishing of the room is that of 1909 and not meant to represent its appearance in Darwin’s day. By 1909 the panelling was painted a dark woodgrain colour. The panelling was stripped bare in the 1930s. In 2008 the mid-twentieth-century carpeting was removed, exposing nineteenth-century floorboards. The perimeter of the boards was blacked and a 13 x 15 foot section in the centre of the room was bare unstained wood, where a rug would have been. This is visible in the 1909 photograph. This waxing is being preserved. These floorboards are lain perpendicular over an older set of wider boards which are visible just inside the main door and in the bedchamber or cupboard. The under boards in the dressing room and under the radiators (below the window seats) are pine tongue and groove and too narrow and uniform to be original. Matthew Beesley, Senior Conservator at Fairhaven of Anglesey Abbey, analysed the paints in several areas of the rooms by stratigraphically examining samples under the microscope, identifying pigments by microchemical tests, fluorescence microscopy and the application of petrological stains to assess the filler materials around pigments. Additional tests were carried out before the restoration process began. Susan Smith, Conservation and Design Officer at Cambridge City Council kindly inspected the site with me and after written application gave permission for the Grade 1 listed property to be painted by Fairhaven according to their analysis. Below are two illustrations from Beesley's report. In October 2008 the plaster surfaces were painted according to the analysis by Beesley. The paintwork was done with brushes rather than with rollers. Below is a photograph from October 2008. In preparation for opening the room to visitors, Darwin's name has been added at the front of the staircase. In Darwin's day the staircases were not lettered as they are now. In December 2008 Matthew Beesley and his team from Fairhaven and Woods began to paint the panelling as it looked in Darwin's day. The following photo of the frieze show Beesley's reconstruction in progress on 6 January 2009. These two photos from 21 January show the next step. A light yellow colour was added to the grooves outside the panels as traces were found that might have shown lightly through the green. These photos from 26 January show the panelling receiving its first coat of the new green colour. What a transformation! 27 January. Cracks and holes in the panelling are filled before further coats of paint are applied. The panels over the fireplace receive their first coat. 29 January. More colours are added to the frieze and ornamental doors. Matthew Beesley explains some of his colour scheme discoveries with Dr David Jones. Jo Poole and Pete Davenport delivered a period shotgun like the one Darwin kept in his rooms. A Dutch film crew interviews John van Wyhe and Matthew Beesley with Darwin's great-great-granddaughter Sara Darwin. Contact: Dr John van Wyhe.